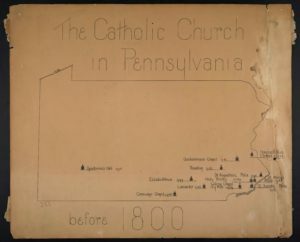 While the founding of Philadelphia as a diocese dates back to 1808 when it was separated from the Archdiocese of Baltimore, the history of the Catholic Church in Pennsylvania dates back another hundred years. The first Mass in Philadelphia was said in 1708 in a private home; however, the first church would not be built until 1729 when St. Thomas the Apostle in Glen Mills was built. 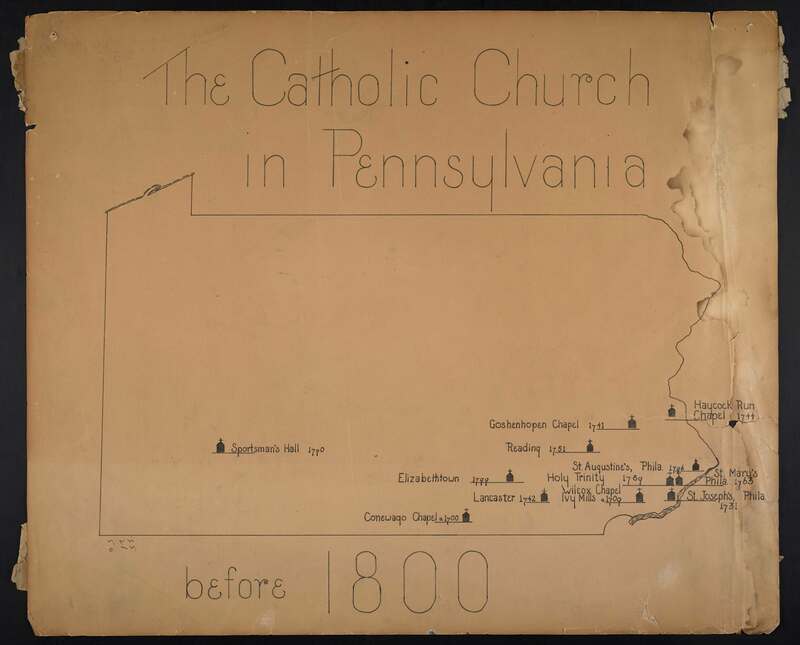 The Catholic community continued to slowly expand so that by 1785 there were three more parishes, Old St. Joseph’s, Old St. Mary’s, both in Philadelphia and St. John the Baptist in Ottsville, Bucks County. Furthermore, at this time there were only five priests for the entire state. As Philadelphia was a major metropolitan hub, its population continued to increase with immigrants coming from counties across Europe. With the influx of these immigrants, Holy Trinity Church in Philadelphia, the first ethnic church in the country, was built in 1789 for the German Catholics and by 1808 the population of Catholics in the city had grown to 30,000. The original boundary of the Diocese of Philadelphia included all of Pennsylvania, Delaware, and South Jersey. The first bishop was Michael Francis Egan, who had only 11 priests and 12 churches under his jurisdiction in Pennsylvania. As the first bishop, Egan faced problems in establishing authority, with the trustees who ran Old Saint Mary’s Parish posing the biggest problem. Trustees were incorporated religious congregations that owned and managed the church property. The trustees at Old St. Mary’s challenged Bishop Egan’s authority on the ability to appoint and dismiss priests assigned to the church. The conflict was left unresolved as Egan passed away on July 22, 1814 and his replacement, Henry Conwell, was not appointed for another six years. Similar to Egan, Conwell struggled with the trustees of Old St. Mary’s. The conflict came to a head when Conwell excommunicated William Hogan, a popular priest from the parish. This was due to the fact that Hogan and members of the parish had continued to push against the authority of Bishop Conwell. Even after Hogan was excommunicated, Old St. Mary’s supported him by ordering all “episcopal insignia be taken down” from the church and that Hogan resume his position as pastor of the parish. The schism would even gain the attention of the Vatican, which sided with the authority of the bishop in a 1822 ruling. With the questions of authority resolved, the Church continued to grow under Conwell and his successor Francis Kenrick. Kenrick was actually appointed as coadjutor to Conwell in 1830 and would become the third bishop in 1842 upon Conwell’s death. 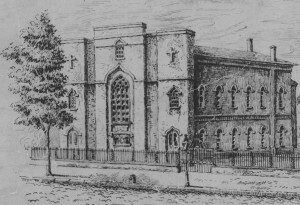 It would be under Kenrick that the church in Philadelphia would greatly expand, with the building of Saint Charles Seminary and the establishing of the first diocesan newspaper, the Catholic Herald. By the end of Kenrick’s time as bishop in 1851, the diocese had added 80 churches, 90 priests, and 150,000 Catholics from when the diocese was founded in 1808. Thomas Hughes, History of the Society of Jesus in North America vol. 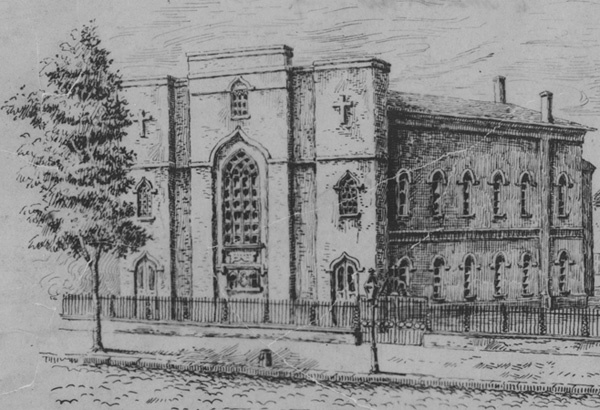 II, (London: Longmans, Green and Co, 1908) 473; Archdiocese of Philadelphia Catholic Directory, (Philadelphia: CatholicPhilly.com, 2018). Archdiocese of Philadelphia Catholic Directory, (Philadelphia: CatholicPhilly.com, 2018). John Gilmary Shea, Life and Times of the Most Rev. John Carroll, Bishop and First Archbishop of Baltimore, (New York: 1888). 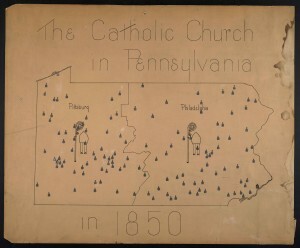 Thomas Rzeznik, “Roman Catholic Parishes,” The Encyclopedia of Greater Philadelphia, http://philadelphiaencyclopedia.org/archive/roman-catholic-parishes/; “A Brief History of the Archdiocese of Philadelphia,” Archdiocese of Philadelphia, http://archphila.org/history.php. 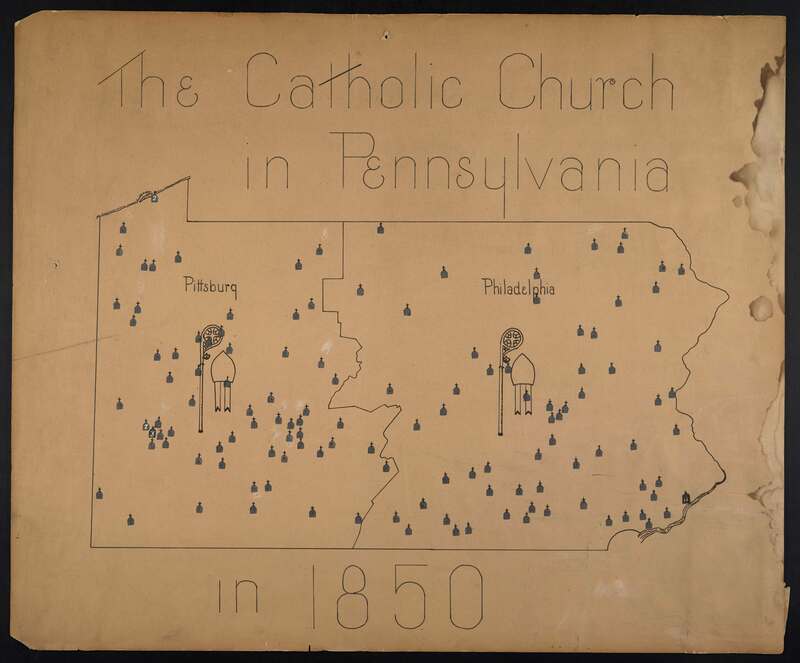 The Catholic Standard and Times, (July 29, 1976); “The Catholic Church in Pennsylvania before 1800,” http://omeka.pahrc.net/admin/items/show/id/7133. Christine Friend, “Philadelphia’s First Bishop,” CHRC (February 22, 2010), http://www.chrc-phila.org/philadelphias-first-bishop/. Martin I. J. Griffin, “Life of Bishop Conwell,” Records of the American Catholic History Society of Philadelphia, vol. 25, no. 2 (June, 1914), 160. Martin I. J. Griffin, “Life of Bishop Conwell,” 161. Katherine DeFenzo, “Bishop Francis Kenrick and His Journals,” CHRC (August 20, 2015), http://www.chrc-phila.org/bishop-francis-kenrick-and-his-journals/.